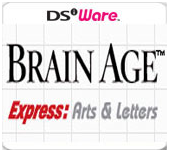 The logo of Brain Age Express: Arts & Letters. Brain Age Express: Arts and Letters (A Little Bit of... Dr. Kawashima's Brain Training: Arts Edition in Europe and Australia) is a DSiWare installment in the Brain Age series, released in Japan as a launch title for the DSiWare service alongside Brain Age Express: Math, though it was released later in 2009 in North America and Europe. In North America and Japan, this game and Brain Age Express: Math are pre-installed on all Nintendo DSi XL systems. Enjoy another round of training your brain in minutes a day with this artistically focused Brain Age title! This edition of the popular Brain Age series offers players a mix of new and familiar exercises, all with an artistic focus. Test your spelling in Word Attack, enjoy literary classics in Reading Aloud, and tune your musical skills in Piano Player. A new Themes mode challenges you in drawing, photography, and voice acting and lets you share your creativity with your friends and family. And if you need a break from things, the always-enjoyable Virus Buster makes its return. Prepare for another round of training your brain in minutes a day! This page was last edited on 8 October 2016, at 00:29.